Earlier today I wrote about the new Greenfoot features. I forgot one: Saving the world. This could be overcome by writing an initialiser method in the world class that creates and inserts all the objects you want to have in the world. This solves the problems, since objects get recreated automatically. However, writing these initialiser methods can be tedious. 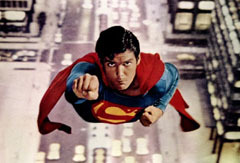 So we come to the rescue: Saving the World. You can now insert the objects you initially want in the world interactively, and then save the visible state of the world as the starting state of your program. Let’s look at an example. Let us assume I want a scenario where the initial objects at the start of the game are a hamburger and three pigs. (Don’t ask). 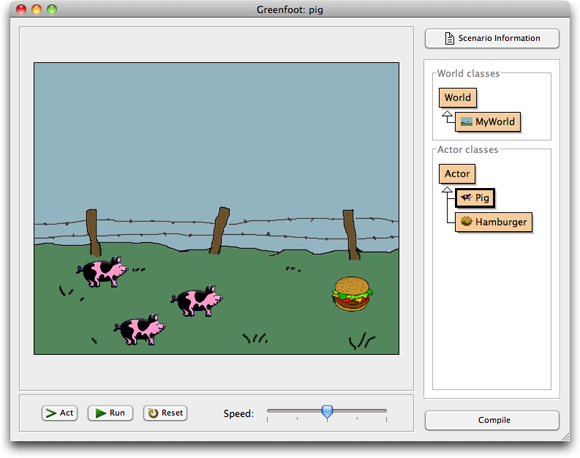 Let us further assume that I have just created the pigs and the hamburger interactively and placed them into my world. Figure 1 shows my world at this stage. This is all well so far – with the problem that the actors will disappear (and I have to manually recreate them) after every compile. 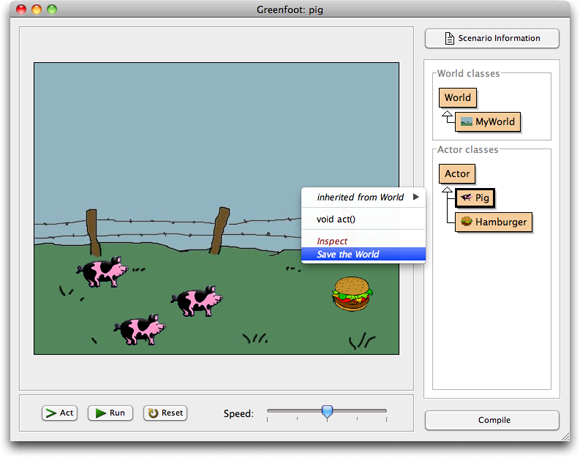 In Greenfoot 2.0, I can now select Save the World from the world context menu (Figure 2). When I choose this function, Greenfoot writes the source code for a method called “prepare” into the class of the world object. 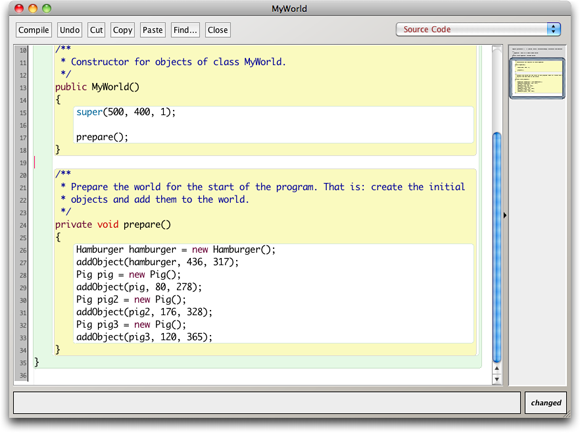 This method contains code to create and insert objects just as they are in the world, and a call to this method from the world constructor (Figure 3). The effect is that next time, when I recompile my class and the world is re-created, the objects in the world are re-created as well. The status of the world is saved. We consciously chose to create source code (rather than, say, serialising the world objects) because it can serve as a good learning instrument. 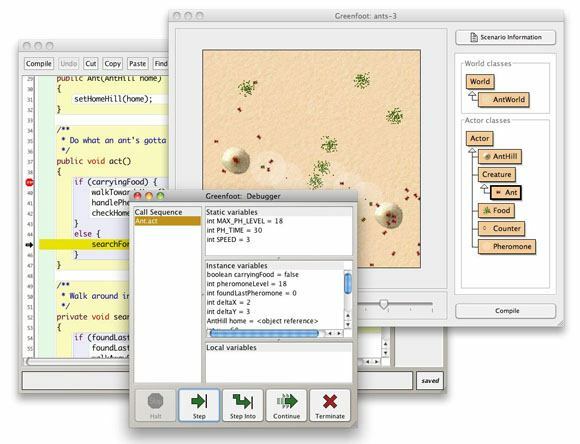 Students can study the generated code and learn from it. The source code of the automatically generated ‘prepare’ method may be freely edited by hand. There is not much special about this method, and you are welcome to adapt it in the editor in any way you feel like. When the world was already saved, and you save it again, the prepare method will be adapted appropriately. The prepare method will include code to recreate exactly what you did to construct the world. For example, if you create and place an object, and then move it, the prepare method will add the object at first at the same position where you first added it, and then move it. This is necessary, because the sequence may have had side effects. If you are only interested in the final position, you can streamline the prepare method manually by editing it (and taking out any unnecessary calls). After the scenario has run, the world cannot be saved anymore. Yes! It’s here! It’s out! 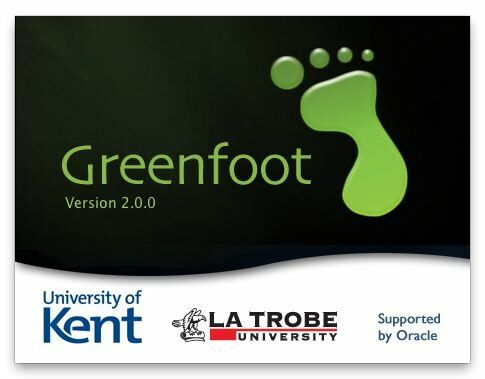 Greenfoot 2.0 has just been released. After a lot of hard work, and about a month behind schedule, we finally completed the work on Greenfoot 2.0. Even though it may not be immediately obvious, this is one of the largest updates we have ever produced for Greenfoot. A lot of work has been done internally, and users will discover the effects of many of them over time. New features are available in the editor, for processing and recording sound, for editing images, debugging your programs, and more. Here, I will summarise the most interesting changes (at least those that users can directly see – there are many internal improvements to performance and stability that I won’t discuss here). But after that, it all might look rather underwhelming at first. The Greenfoot main window looks pretty much as it used to look before. “Where’s the new stuff?”, I hear you ask. Sharp-eyed users may notice one small change: the world name, that used to be shown above the world in the main window, is not there anymore. The name of the world used to serve as a placeholder to represent the world object itself. It had a right-click functionality, that let you access the world object’s context menu to invoke instance methods on the world object itself. The problem was that this functionality was quite hidden, and many users never discovered it. It was bad UI design, since nothing in the name indicated that this was clickable. It had, in fact, almost easter egg-like quality. We have now removed this name, and instead made the whole world area right-clickable. Right-clicking the world itself (or indeed the grey background behind it) will show the world object context menu and lets you invoke the world methods. The next thing many users will discover is the new look of the editor. Greenfoot now incorporates the same editor that is used in BlueJ since the BlueJ 3.0 release earlier this year. 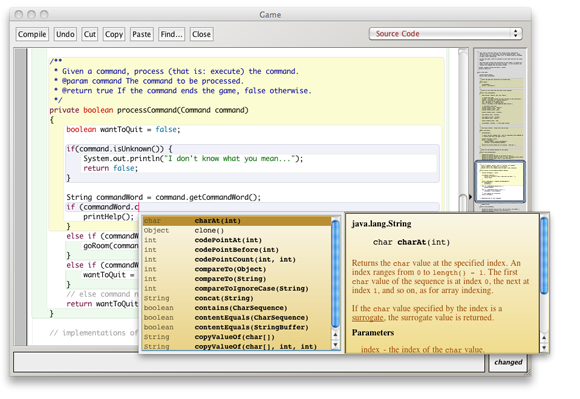 The new features include scope highlighting, a new navigation view, better Find and Replace and code completion. (Code completion is activated by pressing Ctrl-Space.) 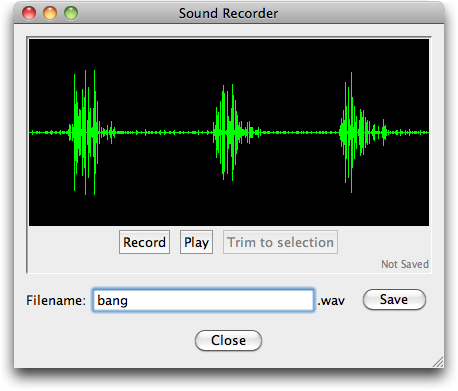 I have described these features in more detail in an earlier blog post, when they came out with BlueJ – read them there if you want to know more..
Greenfoot now has a built-in sound recorder. It can be found in the Controls menu, and you can now record your sounds directly from within Greenfoot. The functionality is very simple — just recording and trimming is supported — but this is what you need most of the time. If you want more sophisticated sound editing, you can still use third party applications (such as Audacity). However, the built-in recorder should be sufficient in many cases. There is unfortunately a Java bug that cases problems with sound recording on some USB connected microphones. It works, however, with most microphones, and we hope that the remaining problems will be fixed in a future Java update. But sound recording is not all that’s new with sound. You now also have more control over sound playback. Yes, mp3 support! Greenfoot can now play mp3 files! Really. So go on and write your first MP3 player. In previous Greenfoot versions, programmers had little control over how sounds are played. They could be started, but that’s all. Now, Greenfoot has a new class called GreenfootSound. It has method for starting, stopping and pausing sounds, as well as looping. This makes working with sounds much more flexible. For short, simple sounds (such as sound effects), the Greenfoot.playSound(…) method is still the best to be used. But if you need more sophisticated functionality, create a GreenfootSound object and you can control the sound in more detail. 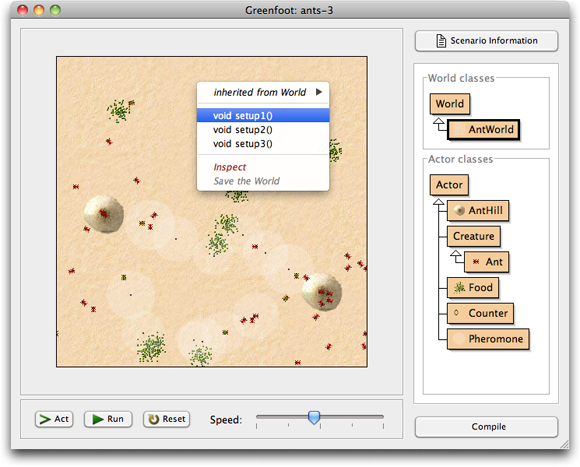 Greenfoot now has a debugger built in. As some of you had discovered before, the code for the debugger has been there under the hood for some time (and there were ways to make it come up), but it was not working well, not supported, not finished, and had no proper interface. Now you can open the debugger window from the menu, set breakpoints, stop the execution, single step through your programs and monitor your variable values. Especially for illustrating the working of control structures, this should be a useful help. Creating or editing images is a task that is very often part of developing Greenfoot scenarios. Now you can start creating or editing images directly from within the Greenfoot image dialogue. 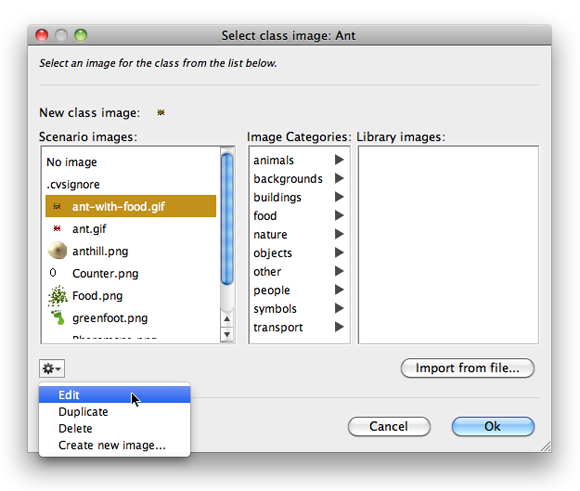 When images are created, they are automatically placed into the scenario’s images folder, so that they are immediately available for use in Greenfoot. The last bit of functionality I’ll talk about today are unbounded worlds. As you know (if you have used Greenfoot in the past), actors cannot leave the world. When they try to move beyond world boundaries they are simply placed at the edge of the world. Breaking out is impossible for them. This has good reason: if actors were to leave the visible world, it can be very hard to get them back. You cannot interact with them anymore, and you don’t really know where they are. In fact, you may not even be aware that they are still there. This has great potential of confusion and difficulty for beginners. The world is then essentially infinite in all directions, and the visible world in the Greenfoot window is just a viewport into a small part of this eternal universe. In this case, actors will be allowed to leave the visible world and walk as far away as they like. For some type of games this will be very useful. When out of the visible world, they will still act, cause collisions, etc. You just cannot see them. So, plenty of new stuff in Greenfoot 2. The last thing to tell you is where to get it. And that is, of course, where it has always been: www.greenfoot.org. Install it, take it for a spin, and let us know what you think. We’d love to get your feedback. Bug reports, of course, but also things you like. You comments are one of the inputs that drive our future development. And most of all, as always: Have fun programming! I forgot to mention one new feature: Saving the world. I have now described this in a separate blog post. In a bold attempt to keep up with the times, and trying to not appear to be the bunch of old dinosaurs which we actually are (in internet age, at least), Greenfoot is now on Twitter. None of us really knows very much about this, but apparently this is what one does nowadays. So now you have the unique chance to follow the GreenfootTeam and find out first hand why releases are delayed, bugs pop up, and how software somehow still gets released eventually.